Today Cleveland has the pleasure of hosting Barnard College’s Seventh President (and past TEDx speaker), Debora Spar. Spar is a vocal proponent of women in leadership & we are very excited to hear what she has to say in her keynote address at Jewish Federation of Cleveland’s Women’s Spring Luncheon. In her recent TEDx talk, Spar focused on the topic of perfection (which seems to be much discussed in womens’ circles at the moment) & how it plays into the way women view themselves & their success. This idea that you can have a “perfect moment,” but that a “perfect life” is not something that exists. She recounts a personal story where she looked fabulous to others, but felt “horrible” on the inside. The pressure that women put on themselves to achieve perfection is immense. Can women have it all? Does work/life balance really exist? Must every home gathering be a page out of Martha Stewart Magazine or a pin off of Pinterest? Past TEDxCLE speaker Jen Margolis posted this on Facebook a few months back & it hit me like a freight train. It’s so obvious, but this is the sad fact about social media for personal use. I’ll admit that I feel less-than-incredible viewing photos of others’ fabulous lives on Facebook (particularly as I’m 7 months pregnant, lower energy than usual & definitely a few [ahem] pounds above my fighting weight). There are nights when it’s all I can do to fold the laundry or make dinner – and I feel bad about it. But the truth is this: I’ve accomplished more than I could have dreamed by age 30. I’ve had an exciting career & done work I’m truly proud of. I have a loving marriage to a man that challenges me to be the best version of myself that I can be. Together, we’ve built the life we’ve dreamed of – building an organization, a business & now expecting our first child. 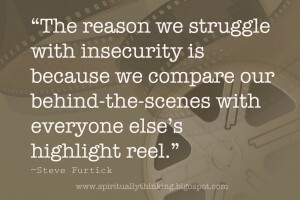 So why should I compare myself to anyone – why should anyone, for that matter?